Using small cookie cutters, cut shapes out of crust scraps. Place on ungreased cookie sheet. Bake 2 to 3 minutes or until lightly browned. Cool completely, about 5 minutes. Meanwhile, in small bowl, beat whipping cream with electric mixer on high speed until stiff peaks form. In another small bowl, beat cream cheese, 1/4 cup sugar and the lemon peel on medium speed until fluffy. Fold in whipped cream. Spoon rounded 3 tablespoons mixture into each pastry square. 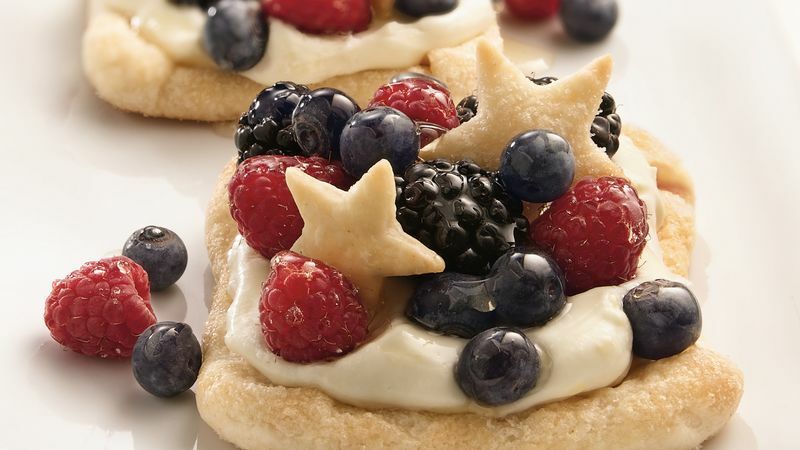 Arrange berries and crust cutouts over filling. Cover and refrigerate any remaining squares. A mixture of 2 tablespoons honey and 1 teaspoon lemon juice can be brushed over the berries.